Planning an upgrade from an existing IBM AS/400e or IBM eServer iSeries server to a new model IBM System i5 can range from a simple disk migration to a complex task involving many components and OS upgrade steps. This IBM Redbooks publication discusses the various topics that are involved in migrating to the new Peripheral Component Interconnect-X (PCI-X), and IBM POWER5 processor technology. We include upgrade scenarios to assist your planning. IBM i5/OS V5R4 contains additional components, functions, and features, which this book discusses. The new features include the new Thin Console support for the IBM System i5 low-end platform. This book also discusses the new hardware-based tape encryption available with i5/OS V5R4 and the IBM TotalStorage TS1120 tape drive. 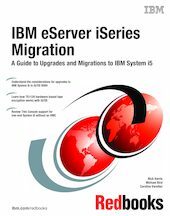 Whether you are an IBM Field Technical Support Specialist, business partner, or client, this book offers the guidance to plan your upgrade or migration to a new IBM System i5 environment.